So I have a new tulip banner to welcome spring! Are you surprised? Of course not. If you're a longtime reader you already know that I'm slightly obsessed with banners and garlands. If you are new here, welcome! I'm Kim and I'm slightly obsessed with banners and garlands! 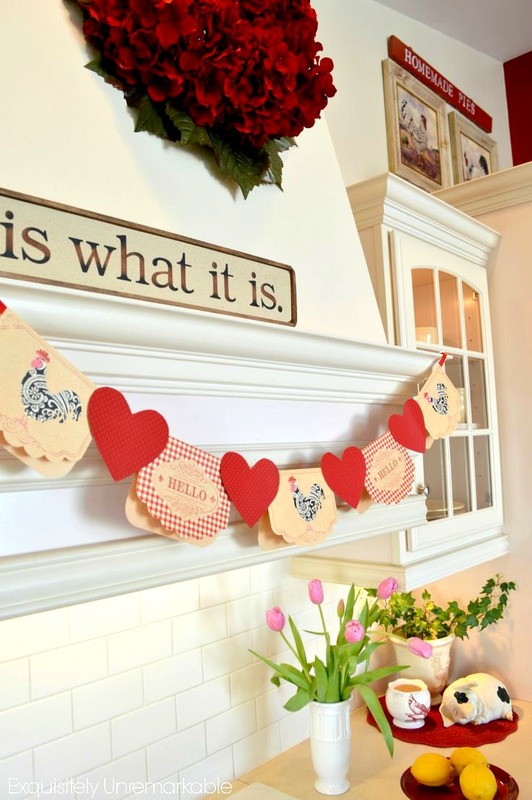 Banners or garlands, I find that people use these words interchangeably, are super easy to make, can be constructed out of virtually anything you have laying around the house (making them extremely inexpensive) and are a super easy way to add a little bit of festive decor for any season. Even better, they are generally flat when folded making them convenient to store and can be hung up with a piece of tape, Command Hooks or a drop of hot glue ~ that's how I hang mine. It's a nifty little trick I learned from my friend Lisa. She's crafty! No need for hammer and nails or holes in the wall. Just like my new tulip banner! Which I must confess I did not make. I would love to tell you that I did, because it is totally gorgeous and all about me, my love of tulips and red and my Exquisitely Unremarkable site, but nope. My good friend Lorri, who blogs at Mom's Hobby Farm, sent it to me last week and I have to say, I was totally blown away. I have blogged about Lorri before. She is super creative and a great cook, something I envy, but have no real interest in doing myself. She had offered to send me a sweet pastel colored rainbow spring banner (she is well acquainted with my banner problem love), it was one she had featured on her blog. I was thrilled and said sure, but when I opened the package, I found a lot of red tulips inside, too. Honestly, my mouth dropped open. 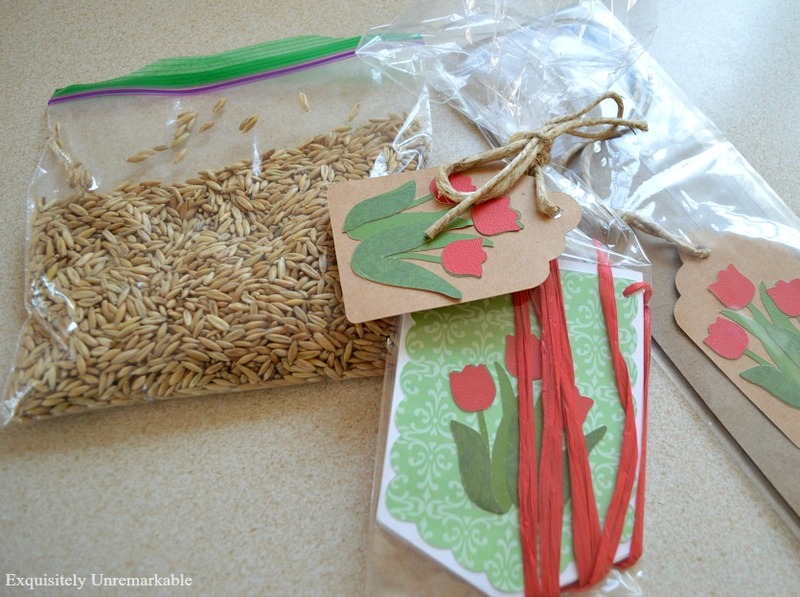 She sent me the pretty mini spring banner, some tulip gift tags, the aforementioned tulip banner and a bag of oats, so I could grow a little grass in a pot and plant my spring banner inside. I haven't gotten to that part of the project yet, when I do, I will be sure to share, but you can bet I hung that tulip banner up lickity split! Lorri made it and is thinking about selling her pretties on Etsy sometime in the future. However, I bet she could be persuaded to take a custom order or two if you ask. The paper is strong and the banner hangs perfectly straight. The colors are bright and her paper choices are darling. I was truly overwhelmed by her kindness, her creativity and her craftsmanship. And now my hood is perfectly dressed for the season and I didn't have to make a thing! I also would like to thank Maria Elena from Our Home Away From Home for the lovely giveaway prizes I won as she celebrated hitting one million views on her blog! Way to go Maria! Maria hosts a link party on Mondays and it's always filled with so much great inspiration. If you are a blogger it's a great party to join and if you are not, it's fun to peek at all the creativity. Speaking of...Maria has one of the most drool worthy craft rooms I have ever seen. I can just imagine her sitting in that room making the springtime pillow covers she sent along as part of my prize and wrapping the items up. Her attention to detail is amazing. 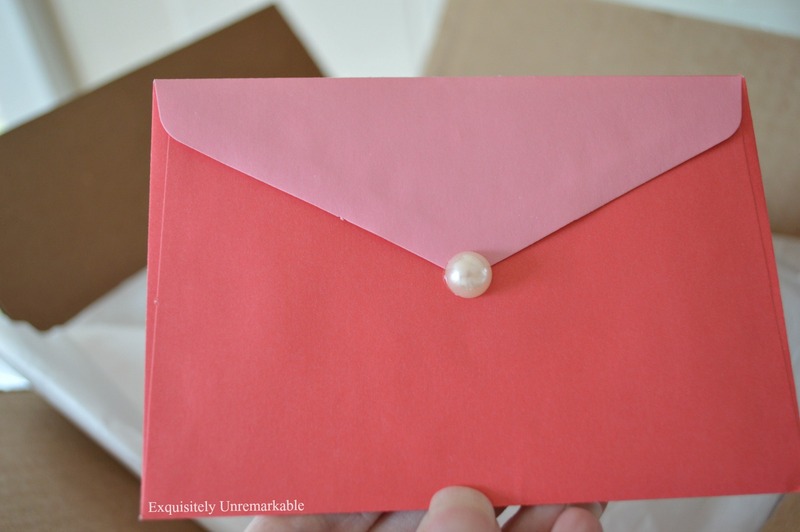 Notice the pearl seal on the envelope. My kids were very taken with this idea. I am so ready for spring with all this loot! I received two tea towels, two custom made pillow covers, a candle and holder, hand crafted gift tags, two small mason jars, handmade labels for my pantry with instructions (thank you Maria!) and best of all...drumroll...a Happy Easter banner!! My job for today is to hang that baby up in my living room and start decorating with the rest of my winnings. The bill for my post office box is coming due soon and I keep thinking that I should get rid of it...I'm a frugal girl...and then just when I do, something fabulous pops up inside of it and I think, hmmm. So for now, I'll pay that bill. When banners keep showing up in there, how could possibly shut it down? Are you signed up to receive my emails? Check out sidebar form ~ You don't miss a post, you never know what could be coming your way! Giveaways, Giggles and Great Crafts! Hmmm....maybe I will get a post office box and some pretties will show up in it! What a pretty display of gifts you received. Love them all! 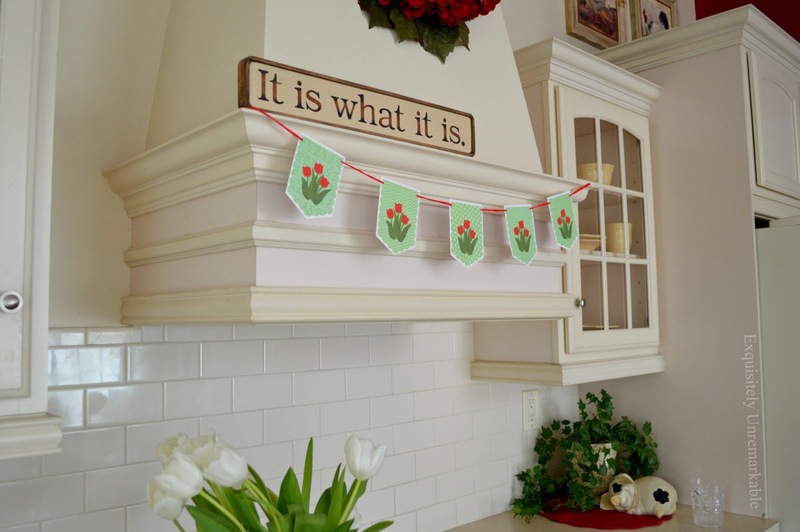 I love your kitchen and I especially love your banners! Bernardine, thank you and I am so glad you like the banners! Making them is truly one of my favorite craft projects! Thanks, Kim, for the kind words. I appreciate your friendship. Now, off to check out Maria Elena's blog. It is one that I have not been familiar with but it appears that I need to fix that asap. Have a great weekend friend. You deserve all this and more Kim. You are such a wonderful and giving lady and any gifts you get are well given. Also congrats on your win from Maria's blog. Hope you are well and we want pictures of the easter banner when you hang it up! Happy Easter to you and yours! Thanks so much, Mary!! You are very kind...and yes, lots of lovely gifts from some very lovely ladies! is just adorable! it's happy and light. they are the ones to treasure. I love your new tulip banner and how sweet that your friend made it for you. And, I am loving the sign - It Is What It Is. I love the banner. And your other sweet prize as well. I always love to see your creative and pretty banners. Have a great week. Happy Easter. Lorri made a lovely one, Kris and I am so excited to have a new addition for my collection!! Your tulip banner is so sweet. I usually stencil words but you have me thinking outside of the box. And yes... banner, garland and bunting (as the Brits call it) are beautiful ways to dress up a window or just about any space. I love your win from Maria. She is just the sweetest and most talented lady in Blogland. She can decorate, sew and create like nobody's business! I won some of her sewn pillow covers awhile ago. So so pretty~~she is very generous. I love your banners, they are always so pretty. I really like the green background you chose for the tulips. It's one of my favorite colors. I've made a few banners but can never get myself motivated to make them for the seasons like y ou have. Right now I'm up to my eyeballs making paper roses (they are absolutely beautiful!) for Mother's Day. It takes me 15 to 20 minutes to make one rose & I need to make about 50. So I don't see any banners in my near future. Thank you, Jenny!! I have always loved the looks of those pretty paper roses, but I am such a lazy crafter. I'm afraid I would make one and then give up!! I would love to see what they look like! I bet they are fabulous!! Love this latest banner and how nice to have the giveaway items to play with next! :) Have a wonderful Easter weekend. ...and I have been playing, Deb!! What a wonderful win! This tulip banner is so Spring and you do know that your hood is meant for a wreath and a banner-did you do that on purpose? Thank you Maria and thank you again for the lovely gifts! I am really enjoying them all!! 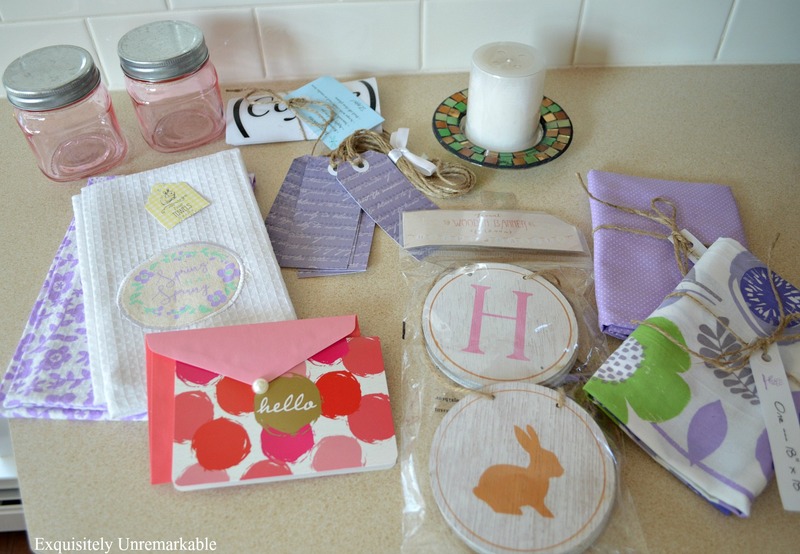 What wonderful gifts you have received from blogging friends! Love the tulip banner - it is so perfect for you. You have the best place to hang banners, too. I don't really have anywhere in my home to hang one. 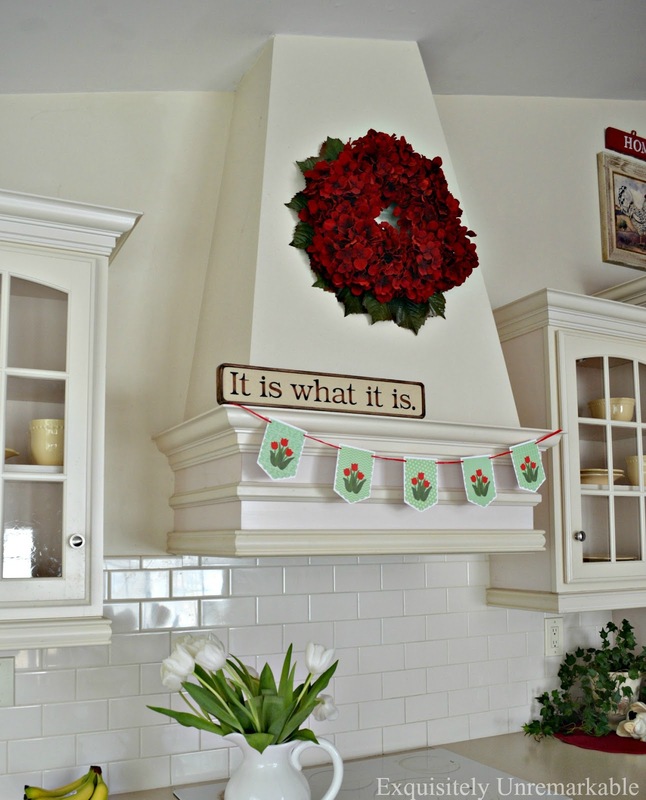 I think you have a beautiful kitchen and the banner is a wonderful way to showcase it! Happy Easter to you! Hey there banner girl . . .
Cuz . . . you are a Tulip Gal too . . .
WOW, you are such a lucky duck....make that "lucky bunny" but also very deserving! Such lovely things and could not be more appropriate for the "Banner Queen!" Cannot wait to see how you use your new pretties! I love the post office fairy too! Your banners are always lovely and so inviting Kim. I would love to sit in your kitchen! I just subscribed! I often forget to do this. What a sweet gift and the banner is lovely in your beautiful kitchen, Kim. I remember loving banners decades ago when the only place I saw them was in the UK shelter magazines. It took the US a while but they sure have caught on, haven't they? They are certainly all the rage now, Dewena! I have become a full blown addict!! Lovely banner. Happy Easter, Kim. I adore your banner, and your ideas are smile-makers. 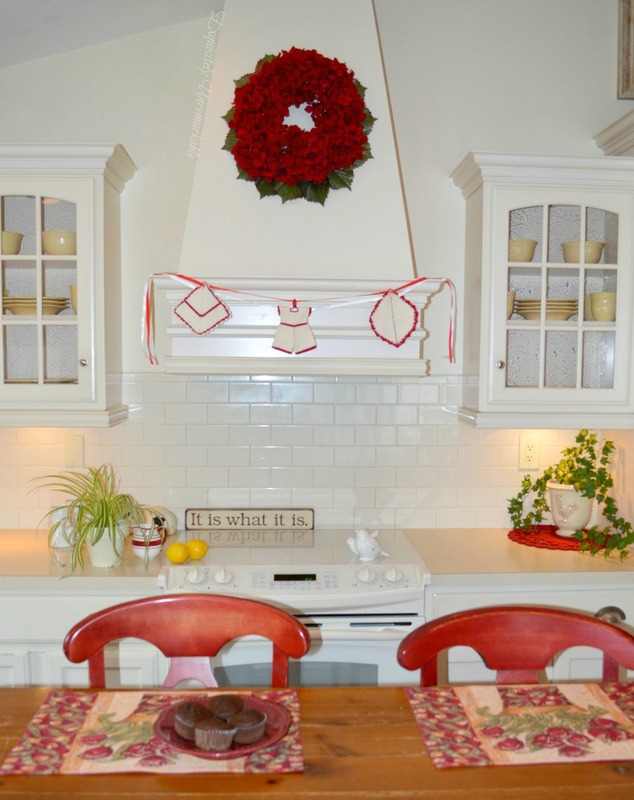 Your kitchen is exquisite! Thank you SO much for sharing your talents with Foodie Friday and Everything Else. Have a blessed, happy Easter! Such wonderful creativity! Tulips are perfect for spring. Lorri is the sweetest, Lorri. I am just the lucky recipient! I love all of your goodies you won Kim! It's always fun winning! Wishing you a Happy Easter! P.S. I love my bag! So very pretty indeed Kim! Wow, you are one lucky lady, awesome goodies. Love that sweet tulip banner. It looks great hanging in your kitchen. I agree, Kristi! I am a lucky lady with some very talented friends! :) Yourself included! !